Here again we look at aspects of our deeper growth within who we are and how all things are awakening. This is linked to our previous lesson, our evolving consciousness. Interestingly enough, this crop circle was discovered in 1993 whereas the other one we looked at last time was discovered in 2014. In 2014, the crop circle has energetically shifted and has moved towards more maturity as seen by the more defined star. When you look at the star you will notice how it is more defined as it has shifted energetically. Also, instead of it being in the corners, it has moved, showing great progression forward in our consciousness. In the circle we are looking at here, of the one which was discovered in 1993, you can also see the energetically cleansed earth, the blue pentagon and the purple star. You can see the teachings of working together collectively by the petals in the green holding the higher consciousness flows for the rest of humanity consciousness (blue pentagon). Interestingly, if you imagine the petals being there also on the star of 2014, you can see that the support from the Angels is becoming more pronounced (star reaching between the petals) for it supports the people greater to love consciousness. Learning to work collectively would bring greater light to our plane. Like the previous one, the golden circle in the background represents a cleansed earth, on an energetic level, allowing our greater awakening to truly begin and allow the higher path to shine upon our earth to bring us into a greater state of evolution and consciousness. * The blue pentagon shows our limited consciousness and how we have tried to find higher ways to balance our consciousness. The blue represents our limited thought creation which constantly creates our illusion upon our earth. However, now we are learning to take on unlimited universal teachings to help us stand in greater truth. 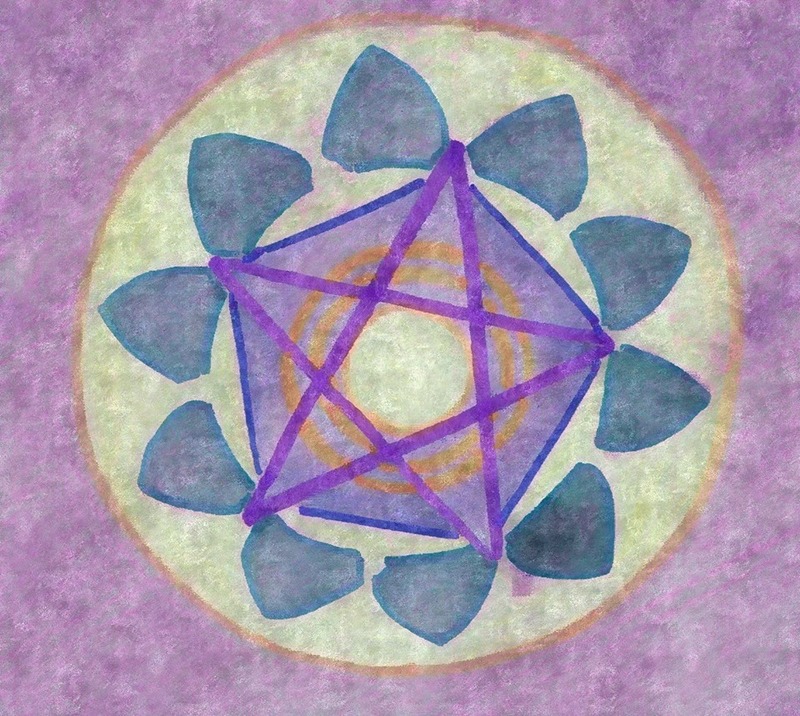 * The purple star symbolizes higher consciousness meeting our human consciousness to take us deeper into awakening flows. Here the thinner purple line shows people opening their hearts (in the green) to the higher teachings. * The golden circles in the circle shows Divine Direction, constantly guiding us to take us into higher thoughts and higher existence, greater teachings would come, also representing the ‘Great Sun Consciousness,’ returning as shown in the solid yellow circle in the centre. For so long the prophesies have stated that light would return to our consciousness to bring love and peace upon this plane. * The petals around the pentagon show people opening their hearts who are learning to come back to the heart, and are healing. They are learning to surround, collectively, all of limited human consciousness shown by the pentagon, to awaken humanity and bring them up to a higher path. They are learning to stand in a higher vibrational self and their heart opens to more beauty and trust. The higher consciousness, from the higher realms supports the people who stand collectively in the love constantly, as shown by the star connecting to the collective love consciousness of the people. The ones who stand in their collective love power are becoming more powerful here in this circle, as the leaves are large and completely surround all of humanity. Their numbers do not need to equal the rest of humanity, for it represents energies. The love energies are powerful and because it is always guided by the Divine, they are blessed and are changing the consciousness of humanity. * The green petals also are showing themselves separate from human consciousness, that being the limited pentagon, showing they are stronger and are learning to become more unlimited with their deeper powers of love together. They are healing in the love and the light from the Angels, for their green is healing and they are in the light as shown in the golden yellow flows. Star beings and the Divine have been teaching us for many years a time would come when we would be called to Collective Love Consciousness, to bring rays of love and peace upon our plane. This is the first time in our human modern times when the Divine has opened the greater gates to our greater ascension, explaining why we came here, our greater purpose, and how we can ascend up higher to become more evolved and at peace. This is also the first time that CAEAYARON, (KRYON) has brought out that the Divine Alignment is coming to our plane, and the people who come to his Divine Pineal Gland Activations will receive the power to hold the coming transmissions to open people to love, to help mankind to awaken to love consciousness, and also to heal all vibrational energies that are keeping humanity limited, for now the gate has opened to becoming unlimited and he is helping us to understand what that means. This is the most exciting time in our modern times we could possibly exist in. I pray, and so do many others, that many people will hear the calls from the Divine so that we can stand united in Divine Will, and Divine Power, together with the Archangels to bring about an earth of love and peace, like always was prophesied. I send you love and peace, always and forever, and thank you for reading this post.